Today I continue my series: How to Write a Murder Mystery. Last time we started looking at how to create the perfect sidekick for your detective. Today I’m going to expand on that material. Yesterday we saw that one of the sidekick's functions is to be a foil for the detective. In what follows I look at specific aspects of this and explore how to tailor him to your detective. Note: I've included this material in my book: How to Write a Murderously Good Mystery: The Major Characters. What are the functions of the detective's sidekick? 1. A way to give the reader information. The sidekick is someone the detective can share his ideas with, someone he can talk to. Also, since the sidekick isn’t as smart as the detective, not as quick on the uptake, she is someone the detective can explain things to and, in so doing, reveal them to the reader. 2. A way to extend the capabilities of the detective. The sidekick is able to give the detective information he wouldn’t be able to get for himself. Perhaps she has skills the detective lacks or simply doesn’t wish to acquire (eg, social skills). Often the sidekick is better than the detective at one thing (eg, ferreting out information). PHYSICAL PROWESS. Perhaps the sidekick has served in the military and so knows about weapons and how to use them in a fight. Or perhaps she knows martial arts. Perhaps this is part of the sidekick’s backstory. Someone the sidekick cared about was attacked and she had been powerless to defend them. As a result the sidekick became an expert in self-defense and made sure that would never happen again. Examples: Arthur Hastings, John Watson, the police officers Miss Marple teams up with and the various sidekicks DCI Barnaby has had with over the years. TECHNICAL PROWESS. I’ve already mentioned this, but it’s such a common skill for the sidekick that I thought it deserved its own point. Often the detective—perhaps because of time pressure or even disinterest—doesn’t wish to become a world-class hacker but likes having one on call. Examples: Willow from Buffy the Vampire Slayer, Bobby Singer from Supernatural, the playful hacker trope, and Mycroft from Sherlock to name only a few. 3. A link to your reader: audience surrogate. a) The sidekick asks the questions the reader wants to ask. b) The sidekick does the things the reader would do, she responds to other characters in ways the reader would. Examples: The first point is self-explanatory. As for the second, think of Sherlock from the TV show of the same name. Sherlock Holmes doesn’t act or react like a normal person but John Watson does. Watson provides the contrast. Without Watson, Holmes wouldn’t seem as extraordinary. 4. The sidekick often gives the detective the ah-ha clue. The sidekick often gives the detective what I like to call the ah-ha clue, the clue that gets the detective to think about the evidence in a new way and, in so doing, realizes who the murderer is. Examples: The ah-ha clue doesn’t actually have to be anything related to the case. For example, in Peril at End House, Hastings and Miss Lemon (this is the TV adaptation) give P the ah-ha clue when they talk about what nicknames come from which given names. 5. The sidekick can nudge the reader. 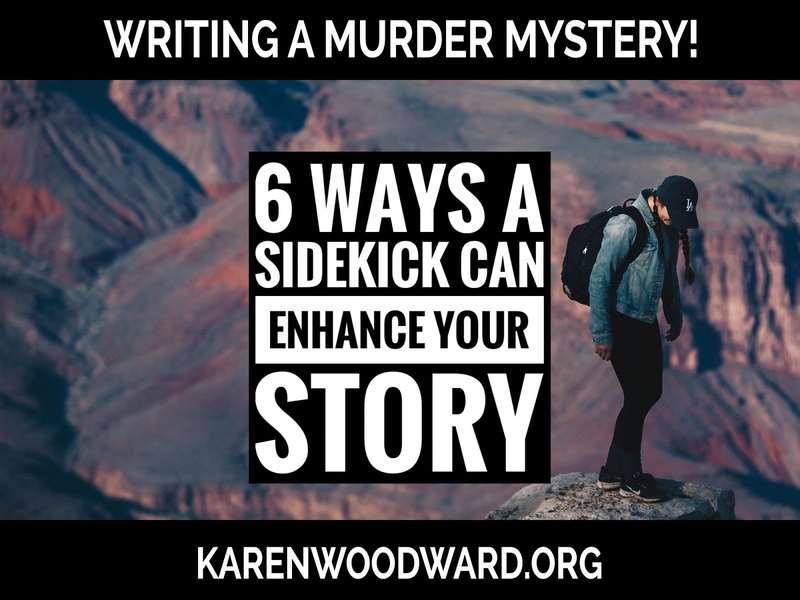 Often the sidekick will, unwittingly, make an observation that doesn’t seem to help the detective (perhaps it could have helped the detective IF he had taken notice) but is a hint to the reader. It foreshadows a realization the detective will have down the line. Other times the nudge comes from both the detective and his sidekick. Examples: In The ABC Murders Arthur Hastings suggests that a particular clue was a red herring but the other characters brush him off. 6. The sidekick’s stability is opposite that of the detective. If the detective is tortured or a bit unstable at times, the sidekick is often a vision of stability. Examples: Sherlock Holmes and John Watson, Mr. Monk and Natalie Teeger. On the other hand, if the detective is a vision of wisdom and stability, the sidekick is often a bit of a mess. Examples: DCI Tom Barnaby and Sergeant Gavin Troy, Detective William Murdoch and Constable Henry Higgins (Higgins isn’t Murdoch’s usual sidekick, but when he is, this is the dynamic). That's it for today! Tomorrow we'll look at possible tags and traits for the sidekick. Till then, good writing! From the blurb: "Miss Emily was old, rich, and afraid—and now, she's dead. ... All that's left is a house full of greedy heirs, and a very strange letter that could solve the mystery—or add to it."